Samsung has finally got around to pushing out the Android 4.0 Ice Cream Sandwich update to its range of tablets. expected to arrive in the near future. Update: We spoke to Samsung, who told us: "Samsung UK can confirm the roll out of the Android 4.0 Ice Cream Sandwich update for the Galaxy Tab 7.0 Plus WiFi and Galaxy Tab 10.1 WiFi devices is live. 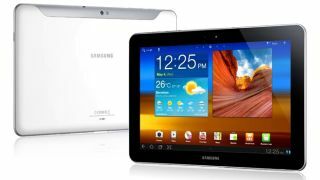 Any further updates for the Galaxy Tab range will be announced in due course." If you fancy upgrading your Samsung tablet then you can do so by either connecting the device to your computer and using the Kies desktop software, or by downloading it over-the-air. Word is the update is only available for UK tablets at the moment, with folks in the US possibly having a little bit more of a wait on their hands. The disappointingly slow progress by manufacturers to get Ice Cream Sandwich onto their products has proved frustrating for many users, and as we see Android 4.1 Jelly Bean creep onto the likes of the Google Nexus 7, Galaxy Nexus and Nexus S, the fiasco looks likely to continue for this next iteration of Android. However, the good news is Google has promised to give OEMs a two or three month heads up on future versions of Android, so perhaps this will be avoided for Android 5.0 and onwards. The Korean firm is still staying coy on Jelly Bean updates, telling TechRadar: "The rollout of Android 4.1, Jelly Bean, has started with Galaxy Nexus HSPA+ and Nexus S devices. We will announce updates to the rest of our Galaxy portfolio of devices in due course." If you're a little unsure as to what Android 4.0 Ice Cream Sandwich has to offer, check out our handy video below.